Opera was made to be sung outside al fresco, when it was first performed in the 15th century at the Palazzo Pitti gardens as part of a Medici family wedding celebration. While Italy has many famous—and famously decorated—inside opera houses, enjoying its outdoor opera venues is one of the true treats of a summer visit to the peninsula. From Verona in the north, through Italy’s heart—Rome—down to Siracusa in Sicily, summer opera festivals fill historic venues dating back to Roman times with classical music that resonates perfectly with these classic venues. Dating to the 5th century BC, when Greek culture ruled the world rather than Roman, and Southern Italy was part of Magna Grecia, greater Greece, the Greek Theater of Siracusa is one of the largest ever built by the Ancient Greeks. While the theater originally held more than 15,000 spectators, several sections, particularly the orchestra and stage, have been dilapidated over the years. After the Greek influence in the area waved, the Romans adapted the theater, which then fell into disuse until the summer theater festival began in 1914. This anniversary season, three classic plays, Agamemnon and Eumenides by Aschylus and The Wasps by Aristophanes will run from the 9th of May to the 22nd of June. 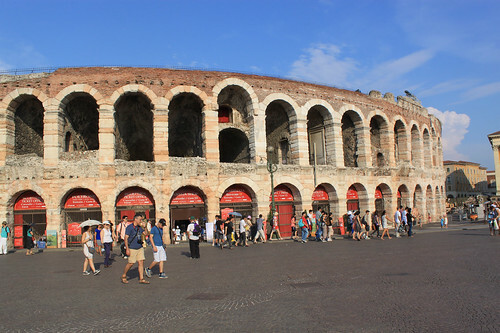 Probably the most well known outdoor theater in Italy, a night at the Arena di Verona—a great city to visit in any season, and just a short train ride from Venice—is a magical experiences, from the candlelit audience to the world famous performers. The nearly 2,000-year-old theater has run more than 90 seasons of its summer festival, which begins at the end of June, and frequently features direction from Franco Zeffirelli, one of the most noted figures in opera. Sets and costumes from productions at both the Arena and other noted opera venues around Italy can also be seen at the nearby Lyric Museum on the history of opera and the Arena’s summer opera festival. One of my favorite outdoor summer theaters is right in Rome, at the heart of the cultural capital of ancient society. The Baths of Caracalla, a lovely, well-preserved site worth a visit in its own right, hosts Rome’s Teatro dell’Opera during the summer. Like the regular season, tickets sell out fast for the operas and ballets performed under the stars. This year, the season runs from the 24th of June through the 9th of August.